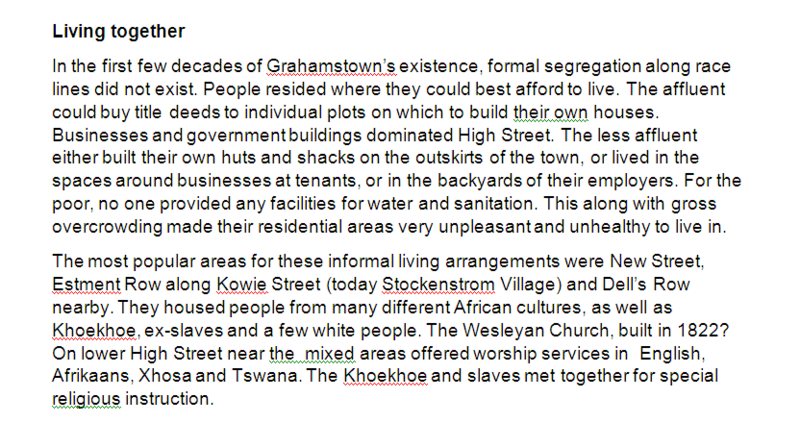 In the first few decades of Grahamstown’s existence, formal segregation along race lines did not exist. People resided where they could best afford to live. The affluent could buy title deeds to individual plots on which to build their own houses. Businesses and government buildings dominated High Street. The less affluent either built their own huts and shacks on the outskirts of the town, or lived in the spaces around businesses at tenants, or in the backyards of their employers. For the poor, no one provided any facilities for water and sanitation. This along with gross overcrowding made their residential areas very unpleasant and unhealthy to live in. The most popular areas for these informal living arrangements were New Street, Estment Row along Kowie Street (today Stockenstrom Village) and Dell’s Row nearby. They housed people from many different African cultures, as well as Khoekhoe, ex-slaves and a few white people. The Wesleyan Church, built in 1822? On lower High Street near the mixed areas offered worship services in English, Afrikaans, Xhosa and Tswana. The Khoekhoe and slaves met together for special religious instruction. The first area designated for one race group was called Hottentot Location. The Cape government in 1828 provided the people who had already been living there with title deeds to their plots. This took place at the same time that government established the Kat River Settlement north of Fort Beaufort for people of Khoekhoe and mixed-race descent. A new law had just been passed, Ordinance ? ?, which released such people from having to carry passes which showed who they worked for. The new living arrangements gave them a chance to have their own homes, without being servants to anyone. The old Hottentot Location was in the valley behind what later became the train station, sloping up to Albany Road and Curry Street. Another well-known painting by I’Ons called “Canteen Scene, Potter’s Inn” depicts the robust social life on New Street of the mid-1830s. British soldiers mingled freely with indigenous men and women for music, dancing and drink. Although slave trading was officially abolished by the British in 1809?, early Grahamstown had a small number of slaves. The Dutch-speaking farmers owned slaves before the British arrived, but had to give them their freedom in 1833. The English settlers were not supposed to own slaves, but many did. Court records confirm sales of people and punishments for slaves who did not behave as expected. During the 1820s and 30s, people of colour who came to Grahamstown often adapted to European culture in a number of ways, including how they dressed and making use of practical implements. • E. Bradlow and T. Westby-Nunn, Frederick I’Ons Artist 1802-1887, Cory Library, Rhodes Univsersity, South Africa, 2014) p. 58.